Beautifully crafted custom kitchen sinks made by Handcrafted Metal last a lifetime! We have manufactured almost every imaginable kind of custom sink over the last 25 years. During our 25 years of success we have learned to make custom kitchen sinks from a variety of metals. We use only the best materials, and with us you are able to customize every dimension and feature, including farmhouse aprons, built-in integral back splashes, drainboards, towel bars, and finishes. If you need a specially shaped or corner mounted sink, we can build it. Want some pizazz in your kitchen? Add a fancy apron with a custom embossed design or woven copper apron inset. Personalized custom features like these are guaranteed to please. If you need a very large, super deep, or especially complicated custom kitchen sink, Handcrafted Metal can build custom made sinks to your specifications that exceed your expectations. Every one of our custom kitchen sinks is available with under mount, drop-in mount, or flush mount rims. Feel free to choose how you want your custom sinks to look, by combining our custom features into the perfect kitchen sink for your kitchen. We can make custom kitchen sinks out of copper, stainless steel, zinc, pewter, and bronze. Also, customers can pick from one or more compartments in their custom made sinks. Start out by choosing a metal type on this page, then browse our galleries, pick any of our custom sinks, and click Customize to enter the dimensions you need and get an instant price. Beautifully crafted copper custom kitchen sinks, such as custom farmhouse sinks and custom kitchen sinks, are our specialty at Handcrafted Metal.If you need a very large, super deep, or especially complicated sink, Handcrafted Metal can build custom sinks in copper to your specifications that exceed your expectations. For more than 25 years we have been building almost every imaginable kind of custom metal kitchensink. Any custom pewter sink is available with under mount, drop-in mount, or flush mount rims. Create your custom kitchen sink in pewter by combining our custom features into the perfect custom pewter sink for your kitchen. 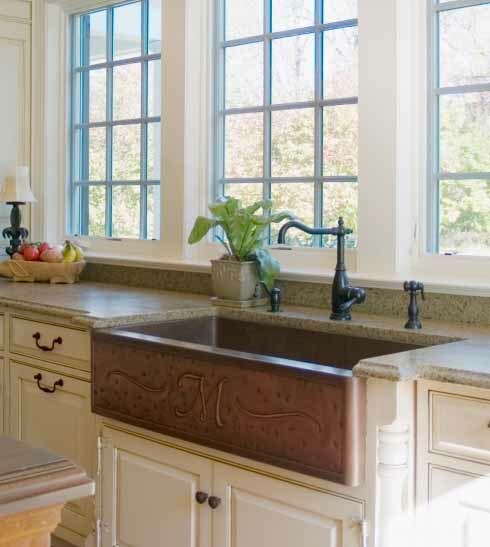 Build your custom bronze farm kitchen sink or custom brass kitchen sink by combining our custom features into the perfect custom bronze sink for your kitchen.we have been built almost every imaginable kind of custom metal sink, including custom brass kitchen sinks and custom bronze kichen sinks. Totally custom stainless steel kitchens sinks, such as stainless steel farmhouse sinks , are a Handcrafted Metal specialty. Want some pizazz for your kitchen?. Add a fancy apron with a custom embossed design or a woven stainless apron inset. We have hundreds of stainless steel sinks designs to choose from. Stunning custom zinc sinks, such as custom farmhouse sinks and custom zinc kitchen sinks, are available at Handcrafted Metal!. Built-in integral back splashes, drainboards, towel bars, and finishes are availabe to these zinc kitchen sinks. Pick any of our custom zinc sinks and customize it your requirements. Choose a metal above to see the many welded, seamless custom kitchen sinks shapes and styles that we have built in your selected metal. We can build any combination of style, finish, and features in any metal. Our wide variety of styles and textures can be applied to any metal and kitchen sink style. Feel free to innovate and make new combinations of Custom Kitchen Sink as well. Our Stainless Steel Custom kitchen Sinks offer cool silvery gray colors in straight modern designs and graceful curved shapes. Our stainless steel finishes include matte, grain, semi-gloss, and mirror. Handcrafted Metal Zinc Custom Sinks extend from chalky natural light gray through our wonderful medium gray patina to fabulous rich dark grays. Our custom kitchen sinks can have smooth, distressed, or hammered textures. For colors with red and brown tones, Custom Made Sinks in Copper offer from natural pink all the way to dark warm brown espresso, and many bright colors in between, with textures from smooth to hammer. Our Custom Brass and Bronze Kitchen Sinks present uniquely golden yellow colors that are free of red tones, with colors ranging from rich gold to dark gray brown to oil rubbed blue black tones. Patina pattern can be solid, mottled, or grained. Handcrafted Metal has built thousands of Custom Kitchen Sinks. The vast array of styles, finishes, textures, and metals available with Handcrafted Metal Custom Metal Sinks provide unlimited choices. Handcrafted Metal takes pride in its very high quality craftsmanship. We see your Custom Kitchen Sink order as an opportunity to deliver our uncompromising design and craftsmanship. You can see that we offer a large number and an amazing variety of custom sink designs. Our long experience building custom made Metal Sinks in every size, shape, and color gives us mastery of the essential methods, processes, and skills needed to produce a custom sinks that exceeds your expectations. 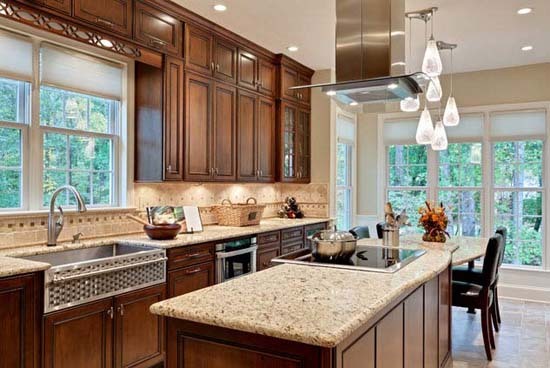 We offer an extensive selection of Custom Kitchen Sinks styles in every metal category. Just browse to the metal and then click the Style to see hundreds of different custom Kitchen Sink products.